The circle of fifths is one of those musical concepts that seems to coerce even the most seasoned songwriters’ eyes to glaze over and strike fear in the hearts of talented new songwriters everywhere. But it’s a super helpful tool, both for understanding the inner workings of basic harmonic theory, and, perhaps even more importantly, for whipping up a great-sounding chord progression to start off your next song! In other words, we think it needs a bit of a demystification. So that’s why we’re here today. Don’t be scared — let’s dive right in! So, what is the circle of fifths, anyway? And how does it work? 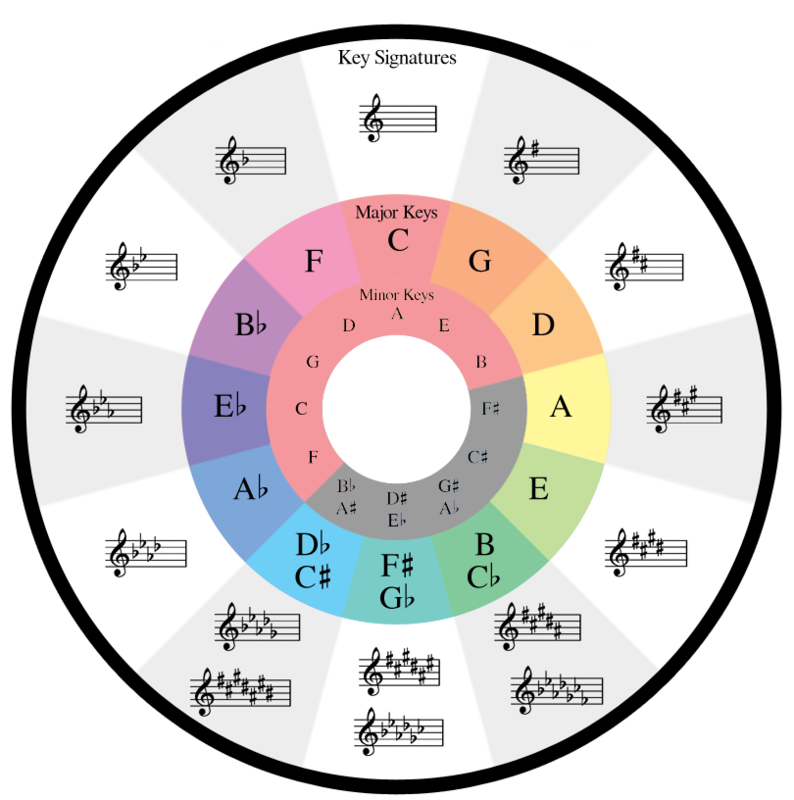 The circle of fifths is a visual guide that shows how key signatures function from a music theory perspective. A note here: what you’re about to learn is pretty simple, but it won’t make much sense if you’re not sure yet about the very basics of chord construction and key signatures. For that, we have a few free online courses to help you out: Theory for Producers, which teaches simple scale types using the MIDI piano roll, and Music Theory for Beginner Pianists, a crash course on learning how to read music from a piano perspective. Back to the circle of fifths. At first glance, we notice that if you move to the right, or clockwise, you’re moving up in intervals of fifths (or seven semitones), and when you move to the left, or counterclockwise, you’re moving down in fifths, but you can also move up in perfect fourths (or five semitones). For this reason, this chart is also called the circle of fourths. At the top of the circle, we begin with the key of C major, which has no flats or sharps (aka, accidentals). From here, every notch to the right moves us up to a different key, an interval of a fifth away. And with every new key, we add a sharp. Moving to the left, you’ll notice that we add a flat with every notch. At the bottom of the circle, we arrive at the key of F# major, which has a whopping six sharps. This key can also be written as G♭ major, which, like F#, has six accidentals that are flats rather than sharps — but they’re the same pitches. On the inside circle, we have the relative minor keys to each of their major counterparts. To refresh, a relative minor scale has all of the same pitches as its major counterpart, but it starts on a different root note. So A minor is the same as C major, with different tonics. On the other hand, a parallel major or minor key is one where the tonic note is the same (e.g., C major and C minor), but the pitches in the scale are different, according to the tonality. In order to find parallel key signatures using the circle of fifths, just match the colors! Now that we’re all on the same page, let’s talk about why mastering the circle of fifths is worth your precious songwriting time. The circle of fifths can show you where to take your chord progressions. Songwriters often run into the problem of not knowing how to develop their chord progressions for maximum impact, or beyond clichés. The circle of fifths gives us an idea of not only how the chords we’re playing relate to each other, but it also offers us logical ways to move in either direction, ascending or descending. Firstly, it’s easy to figure out the scale you’re in using the circle of fifths. Secondly, since relative major and minor keys share the same pitches, you’re free to borrow chords and go out of key as often as you want! Keeping them in the same musical orbit helps the song establish a strong musical context. Wayfaring chord changes might sound interesting, but it makes it difficult for the listener to feel that emotional sense of resolution (more on that below). For example, if you’re writing in the key of B♭ major, right off the bat you can see that your relative minor is the key of G minor, and that the keys of E♭ and F major are closely related. Musical context is powerful because it helps narrow down your options and gives you a path forward when it comes to choosing what chords and keys to explore. For songwriters just starting out, this will help save you lots of time. Pitches in the key of C major. Pitches in the key of Eb major. Using this system, it’s easy to see where your diatonic pitches are, and where to lead your chords from a melodic standpoint. Now let’s see how the minor scales are grouped in the circle. Pitches in the key of A minor. Pitches in the key of C minor. Music is about tension and resolution, and the two most important chords of any key are the I (the root) and the V (the fifth), since the V resolves so nicely back to the I. This is called a perfect authentic cadence, and there are tons more cadences out there. In this very simple way, the circle of fifths helps you gain the immediate context of strong resolution when writing a progression in search of a home base. Instead of memorizing them, the chords are right there! A♭ is the V of D♭, F# is the V of B, and G is the V of C.
There’s one more thing, though. While tools like the circle of fifths can be a hugely important tool in the songwriter’s toolbox, it’s not something you should rely on 100% of the time. The best tools you have at your disposal are your ears and musical intuition. 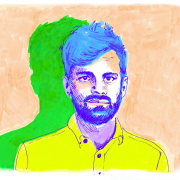 Theory is a great way to help guide and interpret composition, but always start your songs off with fresh ideas, purely from your gut, and let the theory work itself out in the process. All of our mentored online courses come with six weeks of 1-on-1 professional support and feedback on your work. It’s like having a personal trainer, but for music! Whether you’re interested to dive deep into a topic covered by one of our courses — like Unlocking the Emotional Power of Chords, The Creative Power of Advanced Harmony, or Songwriting For Producers — or just to work with a Mentor directly to achieve a specific goal, we can help you get there.